deeper spiritual life through prayer, repentance, discipline, study, service, and evangelism. The prayer power has never been tried to its full capacity. If we want to see mighty works of Divine power and grace wrought in the place of weakness, failure and disappointment, let us answer God's standing challenge, Call to me, and I will answer you, and show you great and mighty things, which you do not know. The call of God is not a call to serve Him in any particular way. My contact with the nature of God will shape my understanding of His call and will help me realize what I truly desire to do for Him. The call of God is an expression of His nature; the service which results in my life is suited to me and is an expression of my nature. The call of the natural life was stated by the apostle Paul? "When it pleased God . . . to reveal His Son in me, that I might preach Him [that is, purely and solemnly express Him] among the Gentiles . . . ."
Service is the overflow which pours from a life filled with love and devotion. But strictly speaking, there is no call to that. Service is what I bring to the relationship and is the reflection of my identification with the nature of God. Service becomes a natural part of my life. God brings me into the proper relationship with Himself so that I can understand His call, and then I serve Him on my own out of a motivation of absolute love. Service to God is the deliberate love-gift of a nature that has heard the call of God. Service is an expression of my nature, and God?s call is an expression of His nature. Therefore, when I receive His nature and hear His call, His divine voice resounds throughout His nature and mine and the two become one in service. The Son of God reveals Himself in me, and out of devotion to Him service becomes my everyday way of life. Also makes a great gift for your pastor. Mouse-over the picture and then *click* for additional details, order info, and the complete text of the poem. 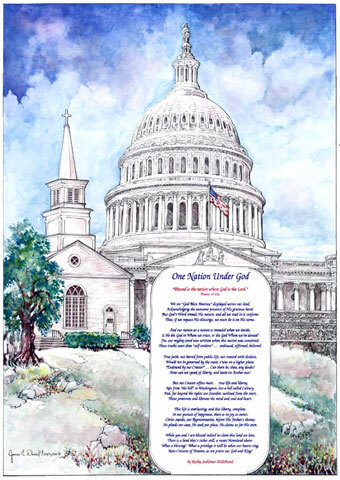 The original poem by Kathy Stahlman Hildebrand and art by James Daniel. Get acquainted with the most courageous, and inspiring people who ever lived -- powerful portraits of St. Augustine, Johann Sebastian Bach, Harriet Beecher Stowe, and 128 other remarkable believers.